My first review did not do the anime justice, and with Season 2 completed a while back, I decided to watch Season 1 again. And it's just as good as the first time I watched it. Yukihira Soma is the star of Food Wars and a talented young chef who wishes to surpass his father's cooking skills someday. He helps out at the family diner until one day his father decides to jet off somewhere, and enrolling Soma in Totsuki, an elite culinary high school with a 1% pass rate (well something as low as that). So only the creme de la creme can graduate at a school with such a low pass rate, and at his induction ceremony, Soma declares he will become the Number 1 student at Totsuki. You can be sure that, after his declaration in front of the entire school, there's a lot of good stuff to come from Soma's time at Totsuki. Soma has to prove his mettle against those who specialise in different cuisines and ingredients, ranging from Italian to meat and spices, while trying to improve his culinary skills to become the best. But it's not 100% cooking, more like 99% intense cooking and competition between Soma and people he meets. Their cooking just makes you wish you had smell-o-vision and the ability to take food from the screen and eat it. Even on a full stomach you can't help but wish for a taste! First world problems. Food Wars isn't all about cooking in the classrooms. Being an elite culinary school, you can imagine there's more to the school than meets the eye. 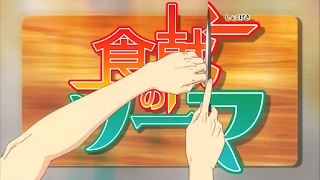 And one is in the form of competitions known as Shokugeki. Two or more people can compete at a time, and each must wager something of equal value to the others, such as being expelled or removing a culinary department if one of them loses. Sadly you don't see many of them, but the ones you do get to see are intense. Other things to look forward to are the special tasks that arise during the year, and show just how strong-willed and determined one must be to make it in the culinary world. Exciting dishes are imminent, from slightly modified old dishes to new works of art, you can see just how good they are from people's erm..."reactions". Quite OTT in my opinion, but I guess it gives the anime an excuse to show some flesh and smoke if you get what I mean =P And make your mouth water from all the hunger. Now for the remaining 1% (I haven't forgotten about it). It's the down-to-earth part of Food Wars, what with Soma meeting new people who help increase his culinary abilities through learning new techniques and ingredients he then uses in his dishes. You can learn through this too, like how there is more than one way to cook a fish for example, and how to get more intense flavours from spices. Pretty interesting stuff. It's not boring as each person brings something new to the table in terms of character and personality, like being really strange or competitive and what not. There are some people you'll come to love at Totsuki, some that make you wonder how they're surviving there, and others you want to hate but can't cos they're amazing when they cook. Food Wars is definitely one for the foodies out there. 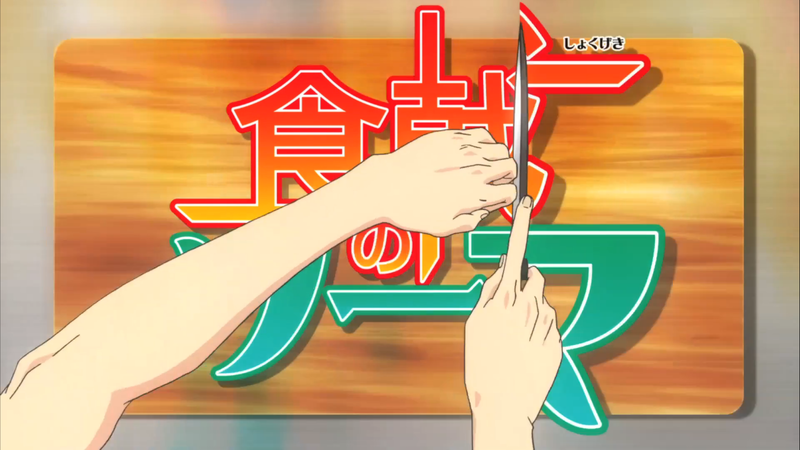 Think of it as learning to cook through anime, with fan service through people's reactions to the dishes made. There are recipes which you can get from the anime by getting hold of the manga so you can try them out for yourselves. I highly recommend this anime and I'm glad I watched Season 1 all over again. And I can say that Season 2 overshadows Season 1 so much. It's that amazing.